The 1st December was the annual Liverpool in London Christmas Social, held at their new HQ in the University of Liverpool, London Campus at Finsbury Square in the heart of London. As members of Liverpool in London, we were excited to see their new offices within the University of Liverpool building and to discover what it could potentially mean for Formby Surveys. Having not seen the old Liverpool in London offices, I was eager to tour the new building and discover what facilities it had to offer. The setup is impressive and it left me very enthusiastic about our future opportunities in the capital. The building houses a stunning boardroom, multiple lecture theatres, vibrant break out space, stylish hot desking areas and even a state of the art VR room. For members of Liverpool in London to have the capability to utilise these spaces to serve their needs is an excellent opportunity. The event itself was well worth attending, it was a great opportunity to meet businesses from London that we may have never come across. 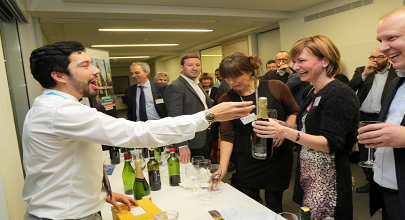 Amongst the networking opportunities, there was a great opportunity to demonstrate our wine knowledge. Unfortunately, my wine knowledge is limited, to say the least (I read if it says “Reserva” on the bottle you’re on to a winner), but Andy’s was much better, getting him to the semi-final! Thanks to the Liverpool in London Investment Officer, Nathan Horan for organising the event, and for continually updating us on Liverpool in London’s progress throughout the move from the previous office, to Liverpool in London’s new home. It was great to meet those of you who I spoke to at the event and I look forward to meeting you at future Liverpool in London events.